We at TechQuark, are particularly very keen about Digiarty's products. The reason is not just because the products are innovative but because they provide innovative solutions to common problems. The products cater to general issues, we face while using simple functions for audio, videos or other file types. In this post, we will talk about another product we recently stumbled upon from Digiatry which is termed as 'WinX MediaTrans'. This is a windows based file transfer tool for transferring, creating and deleting files from Apple products. Photos, music, video, e-books, podcasts, ringtones etc. can be transferred from iPhone, iPad, and iPod to PC and vice versa. This product offers many other utility functions, let us have a closer look at them. We compared the Photo Transfer feature with existing software and found WinX MediaTrans to be pretty quick and simple. 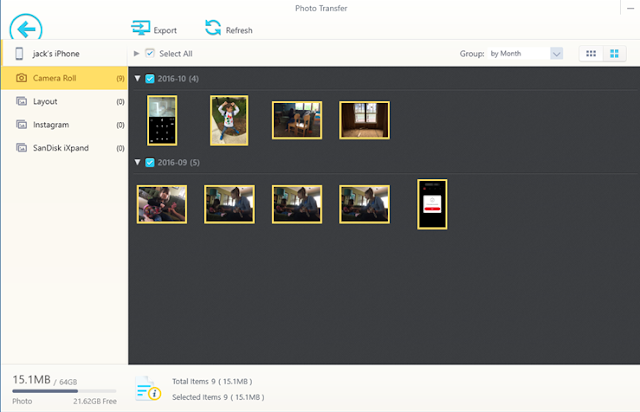 Once the device is connected to PC, you can select the pictures and hit export and this will get the images in 'Pictures Library'. The default location for image storage can be changed to a customized path by going to the 'Settings' screen. Besides this, a preview of images can be seen and grouping of pictures can be done chronologically. Also, the software allows you to get newly shot photos without re-plugging using 'Refresh' button. We were already quite impressed by WinX DVD Ripper and Digiatary has included some of its functionality in MediaTrans as well. This includes converting video files of any format to iOS compatible video including rotating the video to the screen configuration of desired Apple device. On clicking convert, the video gets saved to 'Home Video' folder on the linked device. Also, amongst many, some of the popular supported video file types include mp4, rmvb, wmv, avi, mkv, mov, m4v, flv, asf, 3gp, ts, ogg, 3g2 and f4v. This saves a lot of effort of going through iTunes hoopla. This feature can copy music files to and from the iOS device. The formats supported for transfer from iOS device to PC and vice versa include mp3, aac, m4a, flac, ape, wav, wma, ogg, and oga. Once the songs are transferred, they can be seen on the device similarly as when the transfer is done via iTunes. Further, there is a music manager which will let you make custom ringtones out of your music collection. The music editor of MediaTrans lets you create, convert and delete music on iPhone. In addition to the transfer of music, videos, or audios the software also lets you transfer e-books in EPUB and PDF formats. Also, it can convert EPUB to PDF, HTML and TEXT format. The flash drive feature lets you use your iPhone as a regular storage device. The feature is available for free and you can have the joy of storing your documents on iPhone like a hard drive. Further, MediaTrans can disable DRM for flexibility of watching purchased videos on screens other than Apple devices. 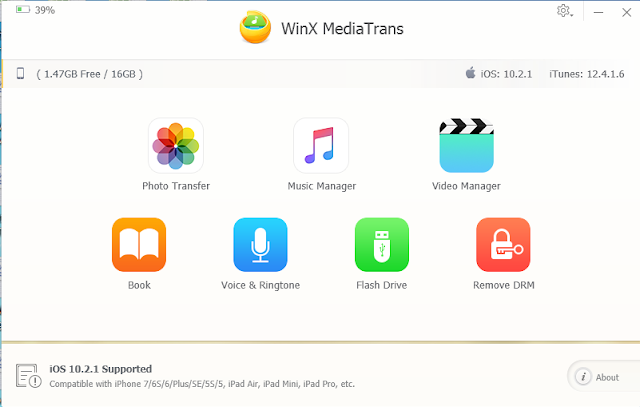 WinX MediaTrans is a light weight powerful, stable and easy to use iPhone file transfer software. It can transfer as many as 100 4K pictures in just 8 seconds, where other tools can take as long as 30 minutes to carry out same activity. Try out the tool and let us know in the comments down below how did you put it to use.